President Trump accelerated his efforts to rescue coal country by pulling the U.S. out of the Paris climate accord last week. But Trump isn't solving the more immediate threat coal faces from its archenemy: cheap natural gas. The shale revolution (that Trump also praises) has made natural gas so abundant and affordable that coal struggles to compete with it. That trend is continuing. Natural gas prices crashed another 9% last week, their worst week since last November's election. Natural gas is now down more than 18% this year. Prices have been cut by more than half since February 2014. Cheap natural gas will make Trump's promise to resuscitate coal -- even slightly more environmentally friendly "clean coal" -- that much harder, analysts said. "Clean coal is fiction in a low natural gas price world," said Michael Roomberg, portfolio manager of the Drill Bit to Burner Tip Fund (DBBDX) natural gas mutual fund at Miller/Howard. The other problem for coal is that there really is no such thing as completely clean coal. Burning natural gas doesn't emit nearly as much carbon. Even Gary Cohn, Trump's top economic aide, recently acknowledged natural gas is "such a cleaner fuel" -- and one that America is an "abundant producer of." That's a big reason why coal consumption by U.S. electric power providers plunged in 2015 to the lowest level since 1987, according to the Energy Information Administration. 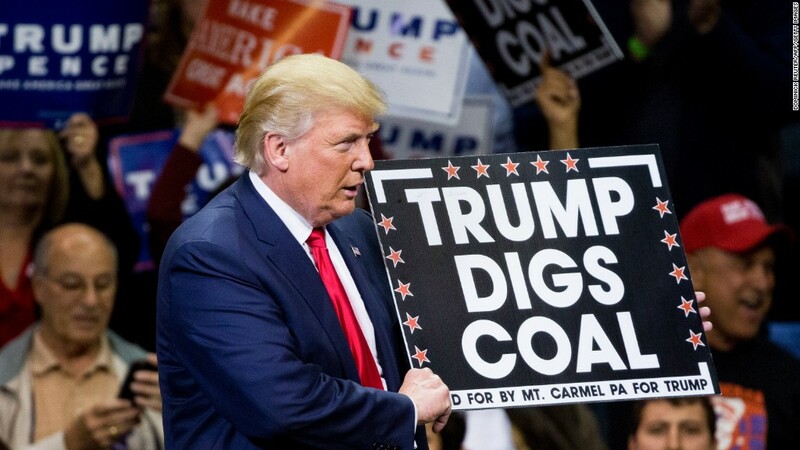 Trump has sought to reverse that trend by withdrawing from the Paris climate accord and ripping up regulations burdening the coal industry -- rules that Trump has referred to as President Obama's "war on coal." But environmental concerns have helped encourage electric utilities to increasingly switch from coal to natural gas and renewable energy. According to a Columbia University study, natural gas is the No. 1 driver behind the industry's implosion. While Trump often blames regulation, Columbia found coal's biggest problem is an inability to keep up with the deep discounts for natural gas. The price U.S. power plants pay for natural gas plunged 71% between 2008 and 2016. Coal prices were down just 8% over that span. 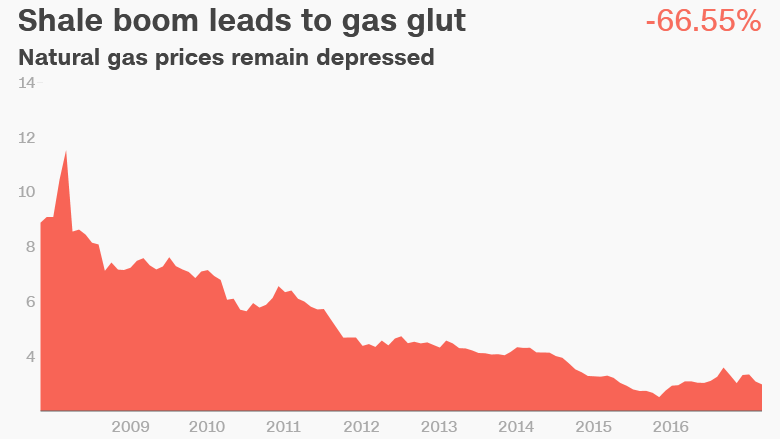 So Trump's deregulation push is really being undermined by the decline in natural gas prices. "People are going to have a hard time making the argument to switch to coal if natural gas gets cheaper," said Darin Newsom, senior commodities analyst at DTN. Newsom attributed the latest discounts for natural gas to concerns about too much supply and near-record production. "We have an oversupply situation. There's just no reason for prices to go higher," he said. The number of natural gas drilling rigs have surged by 122% over the past year, according to Baker Hughes. Some of the new supply is coming from the Permian Basin, a shale oil hotspot that also produces lots of natural gas. Coal has also been hurt by new competition from renewable energy sources like solar, wind and hydro. Trump's own energy policies could add further trouble for coal. The White House wants America to produce more domestic fossil fuels, including natural gas. "We will unleash the power of American energy, including shale, oil, natural gas and clean coal," Trump said in a speech days before last November's election. But the most recent plunge for natural gas prices suggests there may not be enough appetite to justify more gas output. "If we increase production and demand is not there, the market will have an issue with that," said Newsom. In other words, natural gas prices could remain cheap for some time. So no matter how much Trump happens to "love the coal miners," there may be little he can do to change the fundamental laws of economics. It's all about supply and demand.